So, when I first came across At Home in the Whole Food Kitchen a few weeks ago, I flicked through it and found page after page of stunning photos. But then I started to skim read it and it didn’t feel good … too worthy, too healthy, too much quinoa. I put it aside for a while, and then started to remember little bits and pieces about it. One Saturday afternoon, I found myself decanting half-used bags of seeds, grains, sugars into that collection of glass jars I had kicking around because one day they’d become ‘useful’. Where did that come from? I then remembered a small nudge in the shape of a photo of a beautifully arranged store cupboard about half way through this book, everything easily visible, to hand and well-preserved in Kilner jars and the like, in stark contrast to my bomb site of a cupboard, strewn as it is with things tipping out from improperly sealed bags and no sense of organisation in sight. OK, so there might be something to this book. I started to read it properly. Really, it isn’t. I don’t ‘do’ lifestyle lite type books, and I get more than a little annoyed with substitutions like homemade nut milk for, well, milk. I’m totally open to trying new things, but I don’t keep fifty different types of pulse on the go at any one time. I am not one of those people who think that a store cupboard is perfectly well stocked without a dozen eggs in it. I have to strongly disagree with Chaplin on that one, I’m afraid. I’m not meticulous about choosing a baking soda with a low aluminum content. I mention all this because I was in a bad mood when I started to read this book, and I think that the book itself had a lot to do with that bad mood. We just didn’t get on. But, and this is a massive ‘but’, I came to first grudgingly accept it, then slowly to like it in that ‘yeah, I like it, but I’m not going to damn well ADMIT that yet’ way, and now – I’m free! — I love it. It’s excellent. I had to battle past what I wrongly interpreted as pseudo hippy crap, but battle I did, and beneath I found a book with warmth and belief, a book packed with solid tips and advice, and a series of first-rate recipes. Yes, I’m going to have to substitute a little to bring some of these recipes back into the realms of the easily do-able (I’m not wasting my time steeping almonds in water to make milk when I can get that from a cow), but I’ll live with that. At Home in the Whole Food Kitchen is split into two parts – the first deals with building up and maintaining a proper pantry of good stuff, and the second part tackles what to do with it. It’s this first part that’s the most interesting, representing a comprehensive run down of a very wide range of natural ingredients, along with a breakdown of key techniques, such as properly cooking dried beans (hint: that pressure cooker your mum had in the seventies? See if she’s still got it), along with a range of basic foundational recipes, including things like sauerkraut and kimchi, things that can sit around for ages in the fridge, being called into play every now and again to give something a little extra ooommph. I like this approach, and I’ve always done things like this, cooking basics myself to gradually use. I started this blog with a run down of my adventure in making pancetta and bacon, which falls squarely into this camp, although admittedly from a more carnivorous angle. The second half, the recipes, aren’t a let down. There’s a good range of vegetarian and vegan food, and some beautiful food. A dill roasted plum tomato tart immediately caught my eye, as did many of the cakes and tarts in the dessert section. This is good food. I admit to being foolish. I admit to taking a superficial first glance and letting my ill-informed first impression rule the roost. I was wrong. I think it’s important to challenge yourself when it comes to cooking. Too often, it’s easy to just make the same things because they’re easy, and quick, and adequate, instead of stretching, even just a small way, to make something worthwhile. 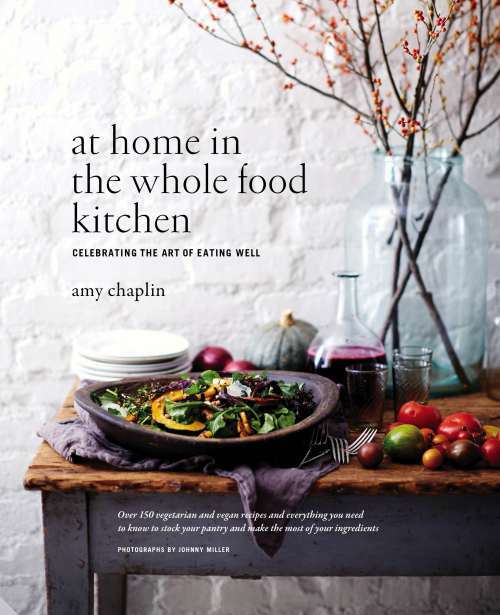 At Home in the Whole Food Kitchen taught me a lot about the virtue in being prepared, being properly organised and having things to hand that can and do transform boring food into mind-blowing food. A very good book. Very good indeed.